Are B2B customers rational beings? Do they base their decisions solely on price, quality, and efficiency? This misconception is perhaps the reason why vendors focus on “hard” issues, and wonder why their customers are not engaged. Fully engaged – customers are strongly emotionally attached and attitudinally loyal. They are your best prospect for organic growth. Engaged – customers are emotionally attached but not attitudinally loyal. They can be tempted to switch by a more convenient, more attractive, or lower priced offer. Not engaged – customers are emotionally disconnected and attitudinally neutral. They have no positive association to your product or service, and your relationship is price driven. Actively Disengaged – customers are completely detached from your company and its products and services. They will switch to a competitor and are distracting you from growth. Gallup’s research revealed that engagement correlates with business results. Fully engaged customers deliver a 23% premium over average customers in share of wallet, profitability, revenue, and relationship growth. 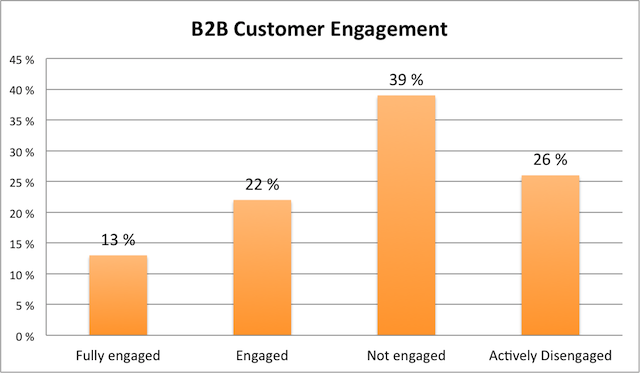 Actively disengaged customers represent a 13% discount on the same measures.